← Dirty tricks from City Hall? City Mayor Jed Patrick E. Mabilog walks to an event in Barangay Monica, City Proper accompanied by reputed drug lord Jesus “Jing Jing” Espinosa Jr. in this photograph sent by a resident in the area. Mabilog and Espinosa are reportedly close friends, and this is the reason why law enforcement authorities are being forced to go slow on illegal drugs in Iloilo City. 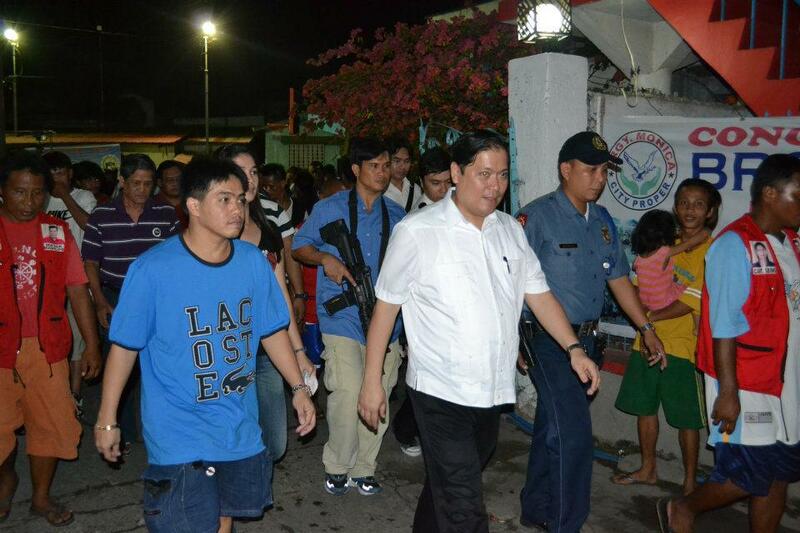 Just look at the heavy armaments of the bodyguards for Mabilog and his friend. They make Iloilo City look like war-torn Afghanistan. Last year, a PDEA official reported during the City Peace and Order Council that all 180 barangays of the city were either affected or influenced by illegal drugs. Mabilog snarled at the PDEA official and ordered him to change the report. He wanted the PDEA report to show that Iloilo City was free from illegal drugs. And when these drug pushers are caught, the first ones who will bail him out are the politicians….nice election move so they say! Is this the kind of attitude we should expect from a local chief executive? TAMA ANO ANG BINULIGAN MU DI SA SYUDAD? BALIK TO SA UMA NGA GIN HALINAN MO. O BASI INDI KA NA TO KA BALIK KAY GIN SUKA KA NA NILA TO AMO NA NGA DIRI KA NAMAN GA PAKITA SANG MALA IN MO NGA BATASAN. TSAMBA GID SI BOSS MO SA PAG SAGOD SA IMO KAY ISA KA NLANG BILIN SA KALIBUTAN.KAG TANDAAN MO TAPUS ELEKSYON E SUKA KA MAN NA NILA KAY BAYAD KA NA KAG TAPOS NA KONTRATA MO.SABAGAY DAMOL MAN GUYA MO INDI KAMAN MAG PAKAHUYA SA LAWAS MO KUNG GAMAY BAYAD SA IMO.LA MO GID NAGAMIT UTOK MO MA ALAM KA.GA PANGUWARTA KA NA GA PANGITA KA PA KONTRA. O WALA KA LANG BALATI AN SA LAWAS.